Four Roses Bourbon workers on strike, reject concessions | Fight Back! Lawrenceburg, KY - Workers at Four Roses Bourbon went on strike Sept. 7, rejecting a concession-filled contract. The striking workers are represented by UFCW Local 10D, UFCW Local 23D and NCFO Local 320. 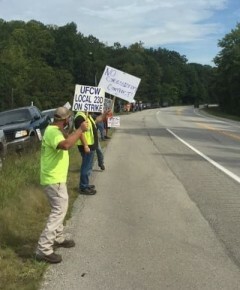 The strike took place after a 100% strike authorization vote at the Lawrenceburg and Cox Creek plants. The workers are striking over a proposed two-tier system, changes to paid-time-off and sick time, and a change to the bidding procedure for jobs. The proposed two-tier system would mean newly hired employees would be making less money than current employees and would never be able to catch up to current employees. New employees would also only receive ten sick days a year and no short-term disability. The last contract went smoothly but after new management took over, things sharpened up. Management waited until the contract was almost expired, asked for an extension and then waited one day before the extension was up to present the unions with the concessionary contracts.